The American Quarter Horse Association, South Point Arena and Equestrian Center and state veterinarian of Nevada have collectively decided to postpone the AQHA West Level 1 Championships scheduled for April 17-20 in Las Vegas. AQHA and the South Point Arena and Equestrian Center are looking into the possibility of holding the 2019 AQHA West Level 1 Championships at a later date this year or determining if the event will be cancelled altogether. AQHA will share more information at www.aqha.com/level1championships and on the AQHA West Level 1 event Facebook page, once this decision has been made. 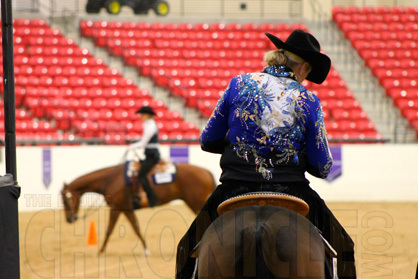 “We greatly appreciate the professionalism that the South Point Arena and Equestrian Center has shown AQHA and our exhibitors with handling this situation,” said Huffhines. Exhibitors will have several options with respect to the entry and stall fees paid for this event, including the option to receive a full refund, the ability to leave the funds on their account for future use including entry or stall fees at other AQHA championship shows, or to apply their payment towards entry and stall fees to attend the potentially rescheduled show. Exhibitors can email show@aqha.org with the exhibitor’s name, horse’s name, amount paid and which refund option they’d prefer. The AQHA Show Department will process these refund requests. As soon as AQHA and the South Point Arena and Equestrian Center determine if the show will still be held at a later date, exhibitors will be notified via email. The South Point Hotel & Casino will waive room cancellation fees due to the cancelling of this event. Please contact the South Point Hotel & Casino at 866-791-7626 to cancel your room reservations. As you are traveling this show season, follow these tips from AQHA Corporate Partner Zoetis to protect your horse’s health. For more information on EHV-1, visit the AAEP website. Updates about the status of the 2019 AQHA West Level 1 Championships will be available at www.aqha.com/level1championships.